March 3rd at 5:01 pm marked one month.... one month since we said hello and goodbye in the short space of an hour. It was peaceful, beautiful, and agonizingly heartbreaking all at the same time. Yesterday at 5:01 pm marked 2 months. Time marches on. I miss our sweet baby.......he was so tiny and so perfectly himself. The Trisomy 18 left it's marks on him, for sure, that little finger sticking up and his little hands clenched, and it made him so perfectly....well......perfectly Josiah. 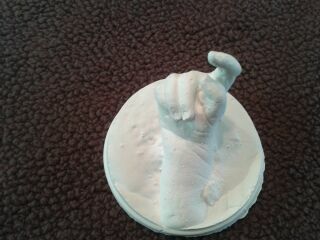 The 3 pictures I have on this post are of the hand imprints that were taken of Josiah at the hospital. I love that his little fingers were captured so perfectly. 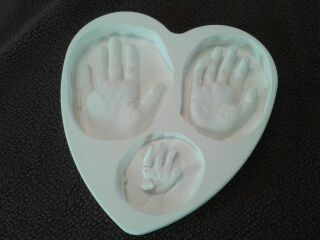 The second one is of Braden, Addison, and Josiah's hands all together. Love it. Lined up our staircase we have pictures of the kids... hospital pics, 1 month, 3 months, 6 months and so on. Up at the top I have Braden and Addison's 1 year pictures and then I have Owen's pictures from the day we had with him. This past week Josiah's pictures were added to the wall. Most days I smile as I walk past all those pictures. Some days I stop and study Owen's and I can't stop myself from asking Why? Sometimes I scream it......sometimes I cry it...... Why Lord? Why did you take him from us? Don't you know we were waiting for him? Didn't you see we were ready for him!? Why Owen? Why Josiah? Why did we lose two?? There are two songs by JJ Heller that I am just really loving right now.... "Your Hands" and "Who You Are". I will post a link to them below, but the words are so reassuring and encouraging to me at this point in our journey. I just love that last part... it is good to be reminded that He does not rejoice in our sufferings and that He will truly make all things right in His timing. So even in my asking "why?" I still know that the Lord is over all these things. And so that is the reason I love that other JJ Heller song... she says, "sometimes I don't know what You're doing, but I know Who You Are...."
How true are those words? We can't see how His plan is going to play out......in time maybe we will be blessed enough to be able to look back and see how He worked all these things out for His glory and our good. But for now, I can completely relate to not knowing what He is doing. I have no idea why 2 of our 4 children have been called home so soon. But, throughout this journey He has taught me to trust in Him. Lately there have been a couple of verses in particular that have brought a lot of comfort and clarity to my thinking....Isaiah 55:8-9, is one that I find myself coming back to again and again whenever I find myself asking "why?" It says, "For my thoughts are not your thoughts, neither are your ways my ways, declares the Lord. For as the heavens are higher than the earth, so are my ways higher than your ways and my thoughts than your thoughts." I might never, this side of heaven, have all my "why's" answered, though I surely hope He continues to let me have glimpses. I hope and pray that He is doing big things with both Owen and Josiah's life, for I know He does all things well. There have been several times over the past couple of months that I have sat down to update this blog. It's been hard coming for some reason. But, in that time I have had lots of time to think. Time to think. Time to pray. Time to be sad and time to be thankful. Mostly what I think about is the amazing way that the Lord answered prayers so clearly in the events surrounding Josiah's birth. How can I not be thankful for that? Inexplicably, but for the grace of God, I have felt a closeness and peace with Christ that is certainly beyond my understanding given the earth shattering grief that has accompanied it. I am so thankful for your continued prayers for our family. Thankful for the amazing benefit that was held for us and for the support we have received from all of you as we navigate these waters. I know that many are wondering how we are doing in the weeks that have followed Josiah's loss. All I can really say is that it depends on the day. Things were just so different with Josiah. It was the knowing that made the difference. Owen's death was so sudden and so unexpected. The day he was born was the beginning of our grief. With Josiah the grieving began at that ultrasound in September. That didn't make it any easier....just different. Your words and the faith that they reveal are so beautiful. Our Savior must take great delight in you. Will pray for much grace and peace as you continue to walk this path. I just read through your blog and my heart aches for you in your loss. 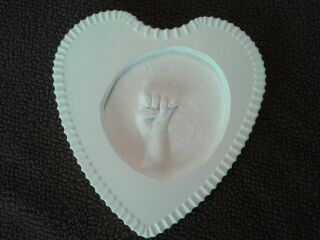 Will pray for an added measure of strength & peace as Isaiah's birthday approaches, I know how hard the milestones are. There is joy in knowing our babies are safe with Jesus, but oh how our arms just wish we could hold them one last time!